On a recent weekday, JA BizTown Mayor Jonah Segal stops to answer a question as he visits local businesses. The hardest part of being mayor is “the busy schedule and signing everything. All of the attention. All of the distractions,” says Segal, a fifth grader at Central School. “Mayor” Segal is among a group of young city executives, CEOs, CFOs, bank tellers, utility pipeline engineers, customer service reps and other key business professionals charged with running JA BizTown, a hands-on, simulated community offered by Junior Achievement of New Jersey (JANJ). The program combines in-class learning with a daylong visit to the JA BizTown facility in Edison. Central School fifth graders and their teachers spent 3 Ч months preparing for the visit, with 12 required in-class lessons on topics ranging from bank accounts, debit cards and free enterprise to applying for a job, the costs involved in running a business, and setting prices for goods and services. 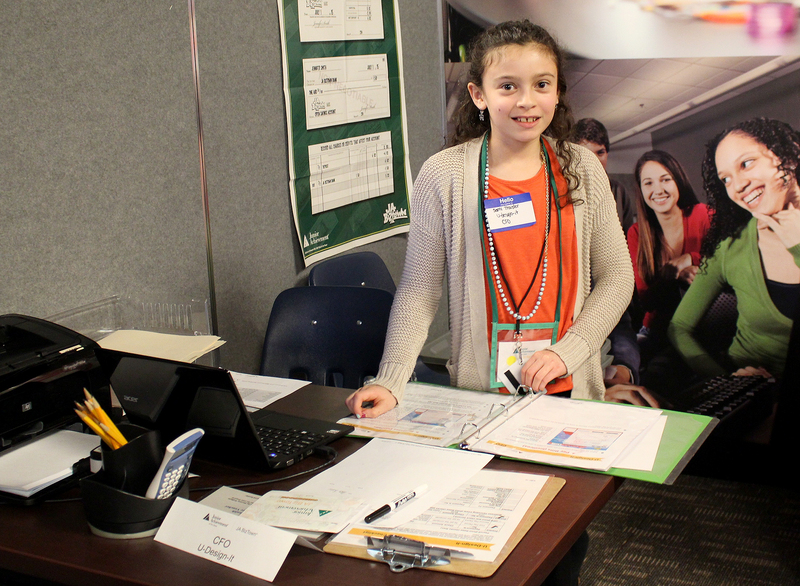 “Our rates and coverage are the best available,” says 10-year-old MetLife Chief Executive Officer Julia Clemente as she addresses the JA BizTown community on Feb. 26. The simulated mini-city boasts 14 storefronts including a bank, a credit union, a radio station, city hall, and such national businesses as Walmart and UPS. 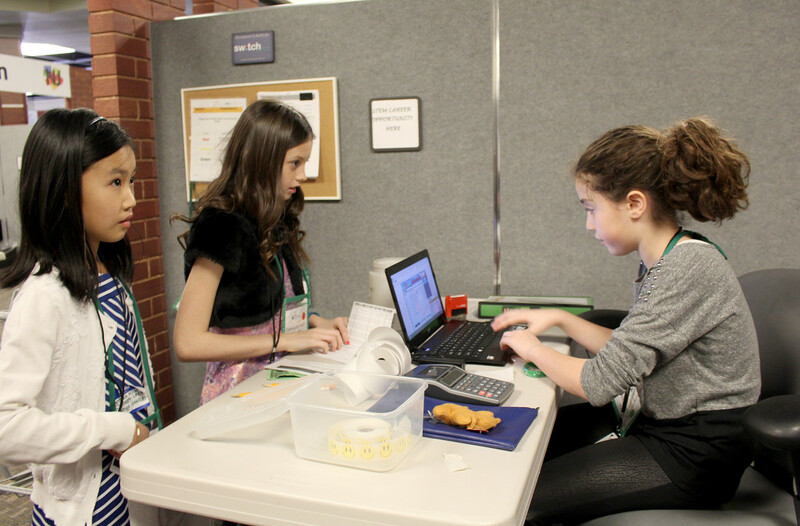 The eagerness of the young entrepreneurs is evident as JA BizTown manager Angela Celeste (a real grown-up) reviews the day’s events, including 10-15 minute required breaks for community members to deposit paychecks, get wellness checkups and run other business-related errands. “While on break, can we go back to work?” asks Nicholas Pringle, a youthful “asset manager” for MetLife who is dressed in khakis and a light blue, button down oxford shirt and tie. Because JANJ partners with corporate sponsors, the program is provided at no cost to the district. In addition, JANJ provides Citizen Guide workbooks, checkbooks and teacher guides to help prepare for the visit. Woodland fifth graders plan to visit on May 31. 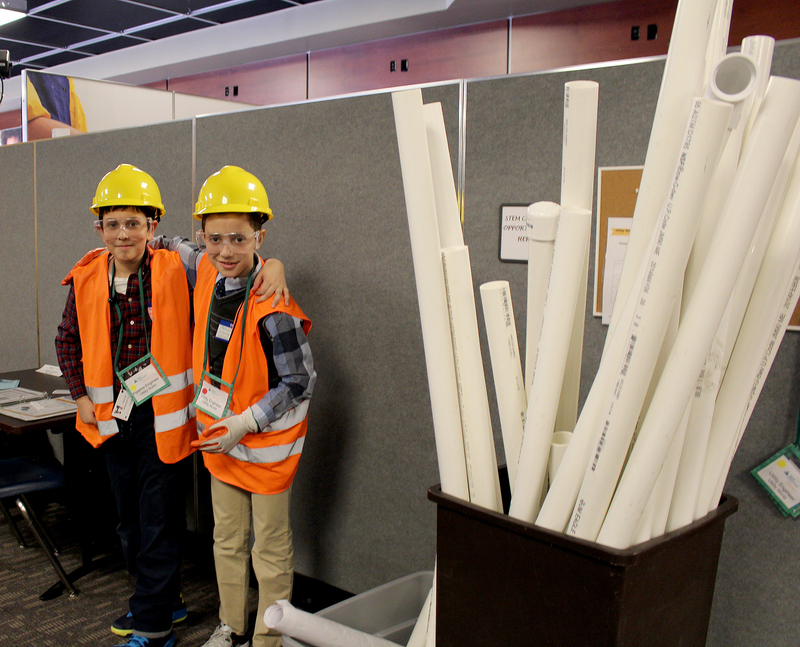 Theodoros Pyrsopoulos (L) and “Utility Engineer” Arion Ulaj get ready to lay some pipe. (above) U-Design-It “Chief Financial Officer” Samantha Traister examines payroll expenses. (above) Central 5th grader Samara Harmatz (R), “sales manager” for Walmart assists customers Cynthia Ming and Kayla Cullinane. 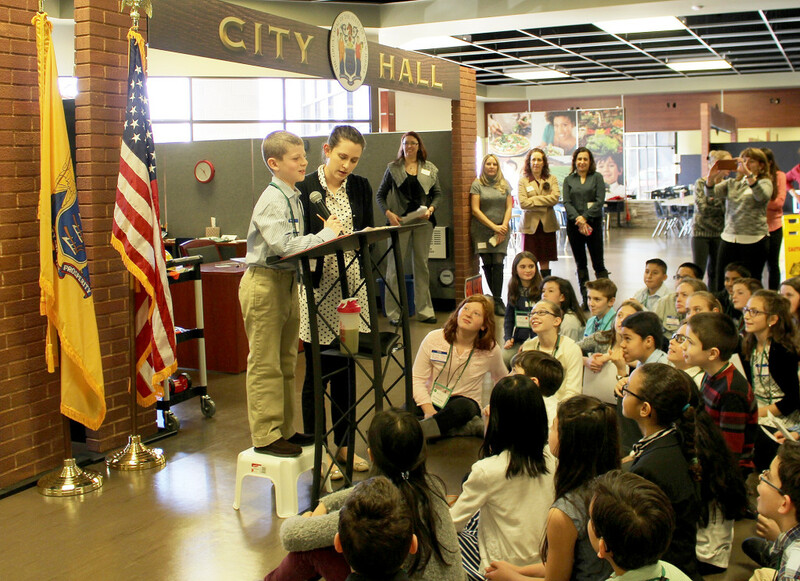 (above) “Mayor” Jonah Segal addresses Central School fifth graders during a visit on Feb. 26 to JA BizTown, a hands-on, simulated business community in Edison offered by Junior Achievement of New Jersey.